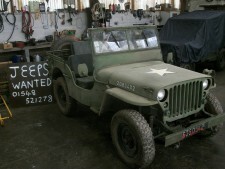 I sometimes offer a jeep for sale in the as found condition straight off the trailer but this is not what people realy want despite what they may say, I usually end up putting it in my workshop and fettling and fixing things then change the price up accordingly and the jeep appeals to a wider audience and sells much quicker. If you see my price for the same jeep increase after a week or so this would be what has happened. 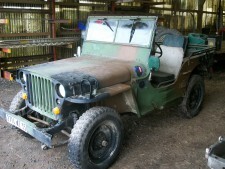 People often ask me for a cheap jeep needing work but when offered exactly this they rarely actually buy it. 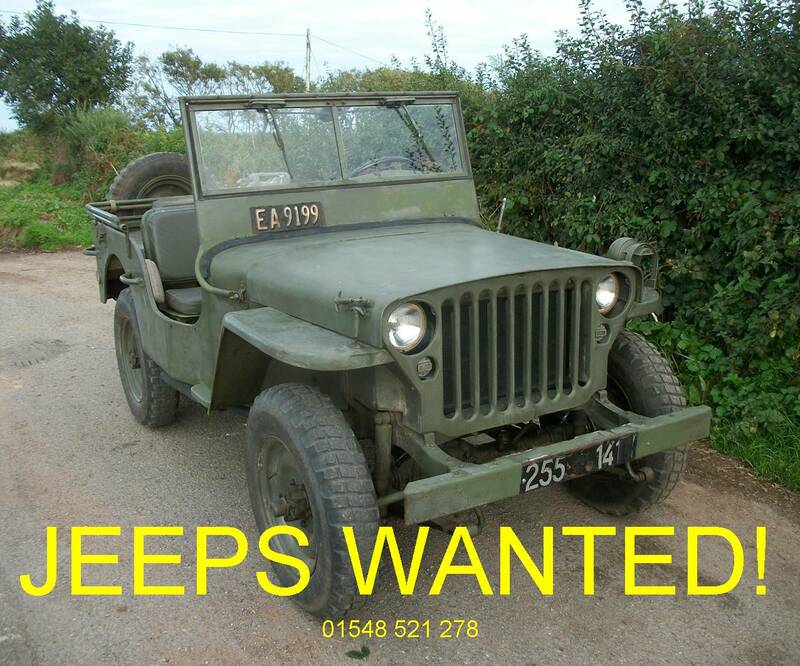 This offers mechanically skilled people with a tight budget a chance to buy a cheap jeep with some repairs to sort out themselves. Use a paper reusable stencil, hold it down tight to the bonnet with little black disc magnets available from ebay. I use off white or cream colour spray paint, use silk or vinyl finish, take the sheen off when dry with very fine 240 grit sandpaper. Brilliant gloss white looks a bit too blingy and synthetic to me. 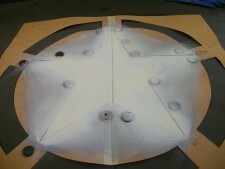 If you want to have a star only then mask off the outer ring areas with old blankets. If you have purchased a jeep from me you will know I give friendly after sales support 24/7 for as long as you own the jeep.Free impartial advice before you purchase a jeep with no obligation to buy one from me, you can still call me for advice. 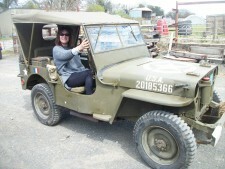 I love talking jeeps. vehicles in Ireland is tiny so I have little chance of sourcing one at home. 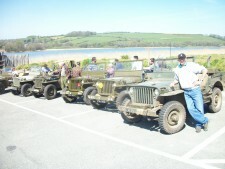 summer fun jeep gatherings from various owners prmises around Devon, including a coastal or scenic road run. 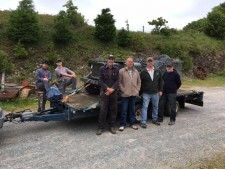 If you would be interested in taking your jeep on one and would like to be informed when we meet up, email your contact details or call on 01548521278 anytime. 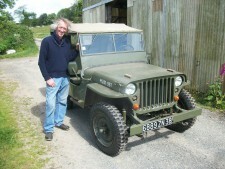 I am always looking for jeeps in all conditions,pre 1965, I pay very good prices dependant on condition and history. I also buy projects, non runners and spare parts. 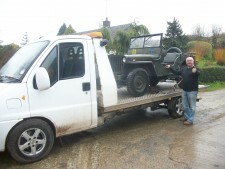 Selling a vehicle can be a worrying business - timewasters, people offering part payment, and so on. 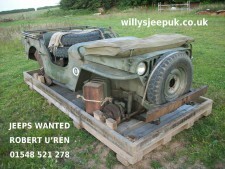 As a real enthusiast with strong knowledge of all things jeep, I can make you an offer over the phone or return email. I have my own recovery trailer (I don't use contractors) and offer instant payment and removal. 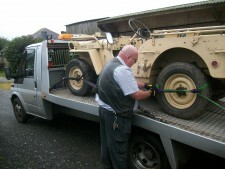 If tyres are flat and wheels seized, this is no problem as I have a low loading recovery trailer with strong winch for careful removal from garage or garden . A price can be discussed and agreed over the telephone before visiting to make sure we are both happy. I can offer a much higher price than the large dealers, as I don't have large overheads or staff to pay! 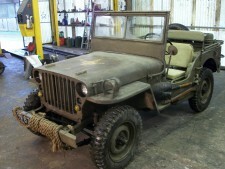 locally, I am then able to give good after sales help if you encounter any problems with your jeep. 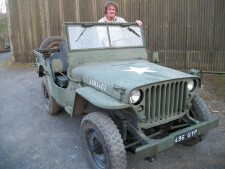 I make sure the jeep buying experience is as enjoyable as possible with a road test around our country lanes in the jeep, 4 post ramp for your inspection, tea and biscuits, never any pressurized sales. 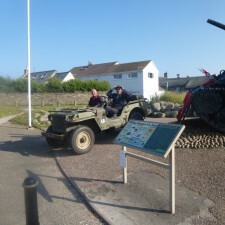 Don't mind a bit if you are going on to look at other jeeps after the visit. The whole experience of visiting me to look at a jeep is an enjoyable one. If you have bought a jeep from me and are 100s of miles away and it goes wrong, I will always help with any problems over the phone and by email. 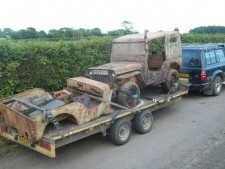 Most of the jeeps I sell have been thoroughly road tested and any little problems have been discovered and rectified before they are re-sold. 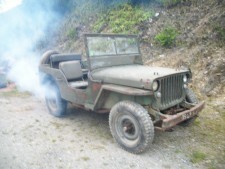 This usually amounts to overhauling brakes, engine tuning, exhaust, batteries, lighting etc, sometimes a bit of bodywork repair but generally the French jeeps are very good runners and fairly rust free. 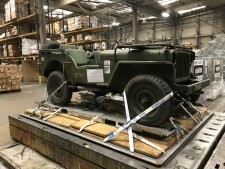 I am always happy to buy back a jeep previously purchased from me. I will always be happy to buy back jeeps I have previously supplied no matter what may have happened to them or what condition they are now in. Often able to pay you a complete refund or offer you a profit if you have improved things on it or a year or two has passed since you purchased it from me. 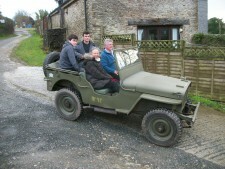 Sometimes have a waiting list for jeeps. 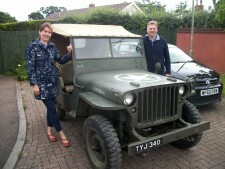 Please call me if you have a jeep for sale or you are interested in buying one on 01548521278 any time. I can help with restoring your jeep including ageing down replacement data plates to look nice and original in keeping with an unrestored jeep. 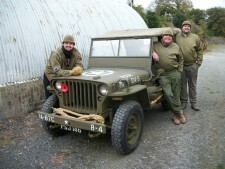 Advising on common faults on old jeeps, ww2 and hotchkiss. 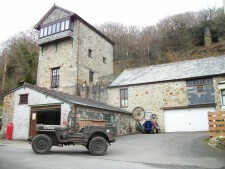 In my engine problems section I can also give some help with clutch and gearbox problems, noisy clutch bearing tip, gearbox faults, engine fault finding, registering your jeep with dvla v5 etc. 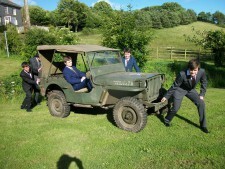 Off to the school prom! 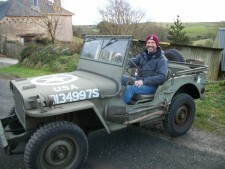 Please look on every page of this site - I have lots of help and advice for jeep owners that many conventional auto-engineers may not know, and I am always happy to give fault-finding advice from my own experience if you are struggling to fix a problem. I will pay good commission for any information leading to a jeep purchase, to find out more give me a call on 01548 521 278. My main business, Reusable Materials, sells salvage and surplus materials and equipment - to visit my website, please click the link: www.reusablematerials.net This jeep website is a hobby gone out of control - I am not a large professional dealer, I don't sell new replacement parts or have any employees, just myself finding, repairing and re-selling a few jeeps. 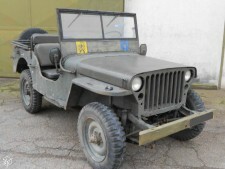 I really enjoy the whole process involved with finding, buying, refurbishing, and of course demonstrating and selling these wonderful little willys jeeps. Please don't confuse me with a large professional jeep dealer (who may have a secretary, posh industrial premises, parts department or mail order service). I don't have all these overheads and this is why my jeeps are usually very reasonably priced. 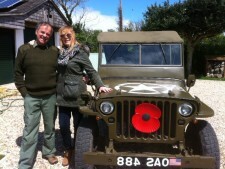 Our farm in Devon was occupied by the American soldiers for the practice for DDay landings. 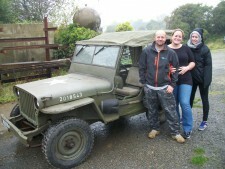 Knowing there were jeeps all around here then, I was very keen to re-instate a jeep on the farm. 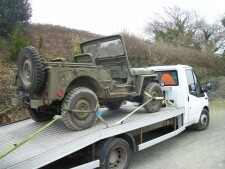 Buying my first jeep without any knowledge about what to look out for was a disaster! 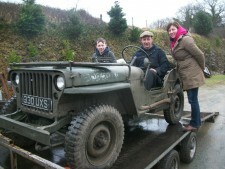 I bought one at a classic car auction after a novice's inspection and then driving 500 mile round trip to collect it. 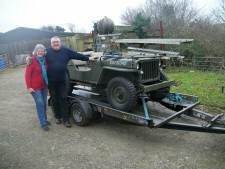 I was faced with a cobbled-together, rusty old jeep which needed a whole winter's hard work to even make it worth what I had initially paid. 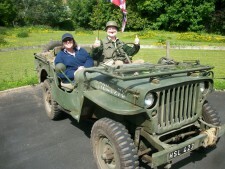 I quickly learnt what to look out for when buying a willys or hotchkiss jeep. A website like this would have helped me so much when I was searching for a jeep. 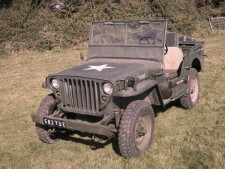 As well as my Jeeps for sale and wanted this website also has advice on registering for the first time in the UK, common problems to look out for on old jeeps, how to overcome difficult problems, modifications, Americanising a French jeep, etc. I will be putting lots of helpful tips and fixes on this website as time goes on, bear with me on this and try and excuse the spelling mistakes which will be later corrected by my daughter. 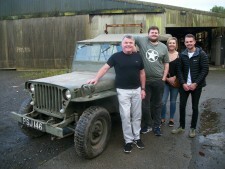 This jeep was sold to an ex-gulf war soldier who had to paint his own landrover this colour on board ship on the way out to Iraq. He has retired now from the army. 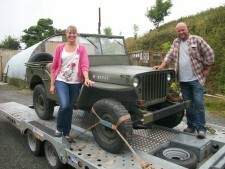 Sold to Steve and Sheila. 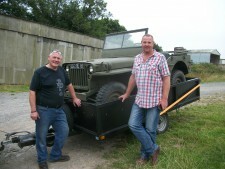 Steve remembers riding in his father's willys jeep when he was a boy, taking pigs from the farm near Salcombe to Bridgewater cattle market in the jeep trailer. ( You wouldn't see that happening today). It's always nice to sell one locally, I will see this one around. Has since been weathered down to look more original. father and son, one each, why not? DM and JM, both vintage machinery enthusiasts. 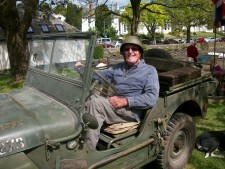 DM had a willys jeep he used on his farm 50 years ago and always regretted selling it. Came to see a ww2 jeep needing lots of work. 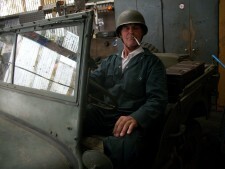 Didn't want a French Hotchkiss at any price. 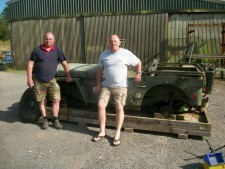 20 mins after seeing this (hotchkiss jeep in its crate), with Bob and his mate helping, we assembled and drove it off down to the beach for an icecream. By the time we arrived back at the farm they both decided to buy it. 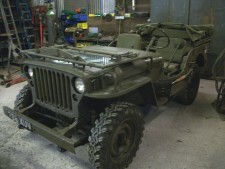 Nice jeep new ford-style body tub around 10 years ago. Just needed some hoops, a back seat and finishing. 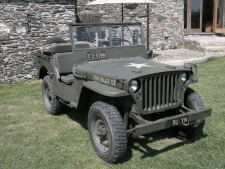 This jeep belonged to a police radio engineer, everything electrical was replaced with new or upgraded with modern alternative. This one is going to be taken to a couple of local shows this year as a running, driving chassis before the body is reinstated. It's a great incentive for me when I get nice feedback after a sale. 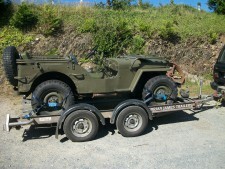 I'm always pleased to hear and see how things are going with your jeep no matter how long ago you purchased it from me. Just a quick line to let you know the journey from you back to Torquay last week went very smoothly, we called in for fuel at the first garage on the main road and then took it easy all the way back We arrived just as it was getting dimpsy .We have been out for a couple of short trips just to get used to driving a jeep and all is going well.We are all thrilled and I know it will give us hours of pleasure be it on the road or tinkering in the garage. Thank you for all your help and friendly expert advice which made the whole experience a pleasure. I think we forgot to pick up old mot Certs and paperwork so I'll give you a ring when I'm next over your way and call in an pick them up and have a chat and see how your doing. After 3 weeks in Devon being recommissioned then off to a new home in Birmingham just a few miles away from where it had originally come. Occasionally the information on this site may contain unintentional errors or inaccuracies. I accept no liability for direct or indirect or consequential loss or damage of any kind arising as a result of your use or inability to use, this site or the information contained in this site.